Iran has inaugurated a new Naval base at port of Jask on October 27. Port of Jask is located closer to eastern end of the Strait of Hormuz. 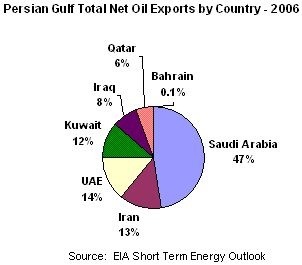 The Persian Gulf countries – Bahrain, Iran, Iraq, Kuwait, Qatar, Saudi Arabia and the United Arab Emirates produce about 28 percent of the world’s oil and they hold about 55 percent of the world’s crude oil reserves. 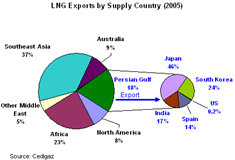 Other than oil, the Persian Gulf region exports roughly 18 percent of natural gas and holds about 41 percent of total proven world’s gas reserves. 600 miles long and its narrowest point is only 21 miles wide. plays a vital role in transporting the oil and natural gas from the Persian Gulf countries to the rest of the world by sea. roughly 40 percent of oil produced pass through this sea route. oil and natural gas supplies go east to Asia including Japan, China, and India. oil and natural gas supplies go west via the Suez Canal and around the Cape of Good Hope in South Africa to Western Europe and the United States. Presently there are only few alternate routes to the Strait of Hormuz for exporting Persian Gulf oil and natural gas. Even those routes need repairs and upgrades or are closed due to political, economic, or geopolitical issues in the region. Here are the pie charts showing oil and natural gas supplies from the Persian Gulf countries. By setting up a naval base at port of Jask, Iran can easily control the oil and natural gas supplies to the rest of the world. Iran is already building up it’s submarine fleet. While inaugurating the naval base, Iran has stated that the new naval base would act as a protective barrier against enemy infiltration. Iran has further warned that in the event of war, it would take necessary measures including the closure of the Strait of Hormuz to protect its sovereignty. Read more about the Strait of Hormuz from Wikipedia. Read more about inauguration of the new naval base at port of Jask from Press TV.